Cambridge, United Kingdom – October 9, 2017 – Collabora Productivity, the driving force behind putting LibreOffice in the Cloud, is excited to announce a new release of its flagship enterprise-ready cloud document suite – Collabora Online 2.1.4, with new features and multiple improvements. The Collabora Online Development Edition (CODE) has been updated to version 2.1.4 as well. What’s new in Collabora Online 2.1.4? These allow the users to create multi-lingual documents with Collabora Online easily. One sentence in English, and the other in German? No problem! Together with the release of Collabora Online 2.1.4 we will also release version 2.1.4 of the development edition of Collabora Online: CODE. The development edition is aimed at home users and contains the latest and greatest developments. We want as many people as possible to try it out and get back control of their own online documents. We’d also love to get people involved in our efforts to make LibreOffice Online even better. Download the Docker Image, enjoy using it at home and why not participate in the project too! Over 1.5 million docker pulls! Collabora Online continues to grow at an amazing speed! 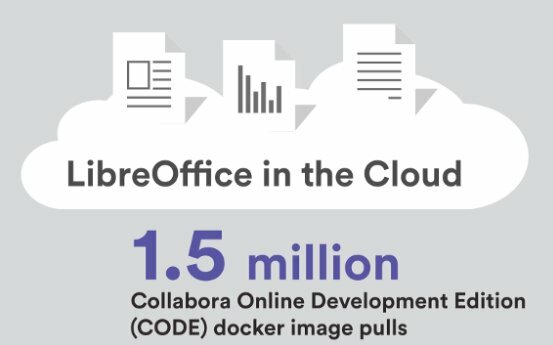 Not too long ago the Collabora Online Development Edition (CODE) reached 1 million docker pulls – now we have over 1.5 million pulls! Get your own docker image from https://hub.docker.com/r/collabora/code/ and check out https://www.collaboraoffice.com/code/ for more details on how to integrate this image if your favorite File Share and Sync solution. LibreOffice conference – 7th edition!